AirClipZ! The best Airplane iPad and smart tablet holder for use in airline travel. Mount your iPad, tablet or mobile device directly on the airplane seat back tray table and lock it in place. Simple to use and carry. If you’re a frequent flier, you know what a pain it can be to put your seat back tray table up after settling in to watch a movie or play a game on your iPad. There is also the problem of potentially dropping your device on the ground and cracking its screen. With AirClipZ, you can mount your iPad, tablet or mobile device directly on the airplane seat back tray table and lock it in place. To adjust the viewing angle simply slide the Adjusters up or down to create the perfect view. If you need to get up, just hang your headphones on the side of your device and you're good to go! Works with the Samsung Galaxy and Kindle products, too! You don’t have to be in the air to enjoy using AirClipZ either. This product is perfect to use your iPad in the kitchen or in your car. Simply mount your iPad or mobile device on a cabinet door in the kitchen or use the optional velcro strap and secure to the headrest of your car. Works with the Samsung Galaxy and Kindle products, too! Simple to use and carry. You can even hang your coat, hat, scarf or purse! Contact us today. 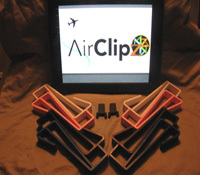 AirclipZ the best Airplane iPad holder that makes flying less stressful.  AirClipZ is an innovative electronics accessory offered exclusively from CAM Marketing, LLC. Purchase our products for a safer and more convenient way to use your mobile device on an airplane or in your home. They’re made in the USA from durable, quality materials that are guaranteed to provide you with indefinite use under normal conditions. We have more than 50 years of combined experience in making products in the United States to back our accessories and ensure your satisfaction. Send us a message today for more information about our one-of-a-kind electronics accessories.